Some things come naturally to me like cooking, eating, and day dreaming. Other things I work really hard for like running, attentiveness, and, apparently, writing about quinoa salad. How many words can I use to describe a delicious blend of healthy ingredients tossed with an Asian inspired dressing, and decorated with a confetti of toasted black sesame seeds? Well, that just about says it all. I do know one thing… this salad is tasty. Tasty, pretty food makes me happy, and happiness is the key to life. Cook the quinoa in the vegetable stock according to package directions. When the quinoa is done, remove the lid and allow the quinoa to steam (leaving it on a low heat for a few minutes will quicken the drying process). Fluff with a fork and set aside. While the quinoa cools: Heat a wok or large heavy skillet to high heat. When the skillet begins to smoke add the sliced asparagus, zucchini and half of the dressing. Be sure to keep the vegetables moving in the pan constantly to inhibit burning (two wooden spoons work well for this); about 4 minutes. Remove from heat. Slice the cherry tomatoes and chop the baby spinach. Do not cook these ingredients. They add a fresh quality to the finished salad. 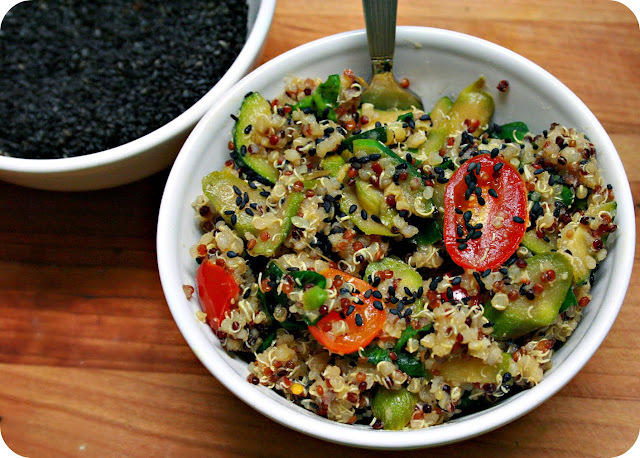 In a large bowl toss together the cooled quinoa, stir fried vegetables, tomatoes, spinach, 2 tablespoons of the toasted black sesame seeds, and the remaining dressing. Garnish with the rest of the sesame seeds. Wonderful salad served warm or cold. Great the next day! Wow, this looks amazing. All flavors and textures that I love, and I've been eating a lot of quinoa lately! Love this, and your blog is beautiful. So glad you stopped by mine! This is a beautiful dish. I love the black sesame seeds in there. I can tell I would feel good after eating this! This is a beautiful salad you have going on here. This is definitely happiness, I love all the ingredients and spicy too. I think I am going to have to make this. Happy Memorial weekend to you. I like that this is well balanced. A lot of recipes I see have 3/4 quinoa and 1/4 additional items. I would much rather see it used to create a meal if I am going to use it. You did just that with all these wonderful as well as fresh ingredients! Also, that dressing mix would be tasty on a lot of other things as well. Great post! This looks scrumptious, Kimmi...I love quinoa and the Asian flavored veggies make this a magnificent salad! It looks and sounds so healthy and delicious. This sounds really really good. I love quinoa and it's hard to find decent recipes for it that aren't boring as all heck. So I'm tickled with this one. Looks great! This is absolutely gorgeous and sounds scrumptious! I'll have to get my hands on some quinoa here in Bangkok (not very common other than in the expat-oriented supermarkets) and give this a try. Thanks for sharing! Great addition to my memorial weekend menu! We need a little of this flavorful salad mix for the whole family to enjoy. Thanks! Hi Ramona! I added a follow by email gadget just for you :) You can find it on the right side of the page. Have a WONDERFUL long weekend with the family. Thanks, Maureen! I brought this salad to a pot luck at work and it came back empty. Definitely a great addition to all those Memorial Day picnics this weekend. I seldom cook quinoa but sure your recipe looks so tempting, flavoured and full of colors. Let me see whether I can find quinoa at my place and next will be going the same as you did for this wonderful recipe. I love quinoa especially in salad form! This looks delicious! All your recipes look amazing ! thanks for the lovely blog ;-) … and your recipes are great inspiration !!!! I love your Asian flavored dressing and this qunioa salad suddenly looks so familiar to me! :-) Very healthy and feel-great kind of salad. It looks very tempting~! Have a great Memorial Day Kim! What a fantastic quinoa salad! So fresh and appetizing. Sounds like a fantastic addition to the menu! SO fresh and healthy! Love it. Mouthwatering deliciousness! I have nominated you for a Food Stories Award! Check out my blog or http://foodstoriesblog.com/food-stories-award! Have a fantastic week! Looks amazing! So healthy, my kind of salad. I am definitely going to make this. Thank you for great recipe. Delicious!!! Would you like to follow each other?